Creating responsive systems as a way to establish feedback between an external "influence" and system of objects (panels, surfaces). As some of you know, I didn't have my laptop last class because it crashed. Can someone give me his/her files that were completed in class? For anyone that's taken Karen's 507 class (Eve & James at least), how are you finding the panel manipulation abilities and responsiveness in grasshopper as compared to our assignments in Revit? I think this tool is a much better option for achieving a performance based reaction. Has anyone tried exporting their Rhino model to Ecotect and testing the anticipated solar performance? I'll post some images if I can get it to work. I want to try incorporating it into Ecotect but I haven't figured it out yet, would you please post some notes if you could get it to work? 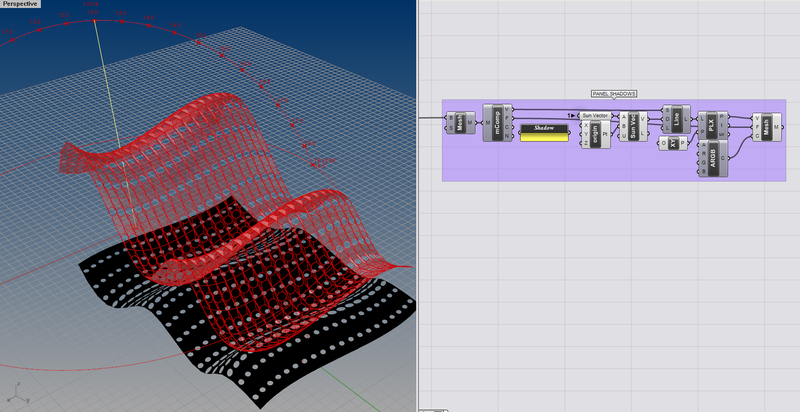 I am going to try exporting my Grasshopper Rhino file as a .dxf file and then importing it into Ecotect. I would like to try that too…let me know how does it go. I would agree about it's ability to respond Richard, the rhino/grasshopper based model is much better. That said, without a clear idea of what your design intent from the beginning, Revit to me at least, for the time being, is a more amicable conceptualization sketch pad. The file you did for "Solar Responsive Panel System" has a function "ARGB" (Split ARGB). I couldn't find that in GH. I can only find "AHSV." Is that a new or old function? where can I find that? I am exploring the shadow aspect for my solar responsive panel. I can shadow of the entire surface as black colored region. Is there a way to reflect the aperture generated by the responsive panels in the shadow? This can be helpful to look at shading aspects. I have attached a solution… you have to mesh the panels and then use the mesh vertices and faces to drive the mesh shadow. 2. The shadows won't interact with other objects. Thank you for the response. I followed the similar procedure, but I am still not able to get the shadow pattern. Also, I am not able to download the panel shadows definition file. If possible, could you please upload it again? It will be helpful to refer to it. Got where I went wrong ! Ok, I first had trouble signing into my Wiki account, now I have trouble uploading images from my computer. When I click on the insert image wizard, it doesn't give me an option to browse for a local file and upload it. Can someone please give me a tip on this? The image wizard will allow you insert a file to your post only after you have uploaded it to your page's files first. After you have done this, you can use the image wizard to select an attached file.